The ultimate in ying and yang and one of fashion’s best loved looks, this bold motif first grabbed the attention of fashion followers in the 30s, and then, a few decades later, played a vital part in the Swinging London scene, which saw the boutiques of Carnaby Street chock-full of stripey garments. We have the Queen of Stripes, Vivienne Westwood, to thank. She used the pattern to great effect in her famous Pirates collection and has revisited the theme regularly throughout her career. Picasso was another famed devotee of the striped look – his favourite black-and-white T-shirt became part of his iconic image. Why are stripes loved so much? After all, for much of history, black-and-white bands had negative associations. Michael Pastureau’s book The Devil’s Cloth, A History of Stripes, tells a story riddled with cruelty and persecution. 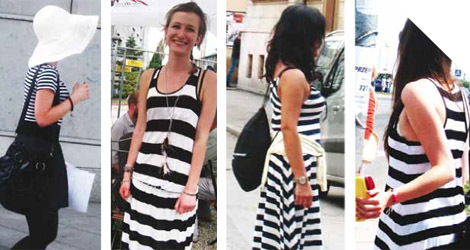 In medieval times, stripes were associated with those living on the margins of society – prostitutes and hangmen. Later, stripes were the uniform of servants and prisoners. Perhaps it is these references that make the black-and-white stripe so powerful – they are simultaneously modern and exciting and old and threatening. Whatever associations they have for you – classic, edgy, pirate, punk, risqué, dangerous – the question is, how bold will you dare to be? Good post…..Interesting fact about striped clothes; in the medieval period, any surface that had a background that was hard to distinguish from the foreground was apparently disturbing to their eye. As a result, only people on the fringes of society such as entertainers and prostitutes wore stripes.